I know N8 and E7 users haven’t even got Anna yet to be looking too far ahead into Belle but more pics have appeared, this one a little clearer than before, showing Belle (or whatever B girl name) on the E7 and N8. There seems to be an odd use of Pure font for Menu but Nokia Sans in the icons. Early days yet, no? The toolbar at the bottom (back, search and options) as you see just stretches out.As noted before by comments/twitter, these buttons do somewhat resemble Windows Phone – though that’s pretty standard (Android has back/search/menu too). In a blogger event at Switzerland, this new update (after Anna) was said to be coming at end of 2011 or beginning of 2012. Being Nokia there is of course no specific time-frame, especially as the vague “end/early” mean next to nothing as we all know from our early 50+ 2011 update. 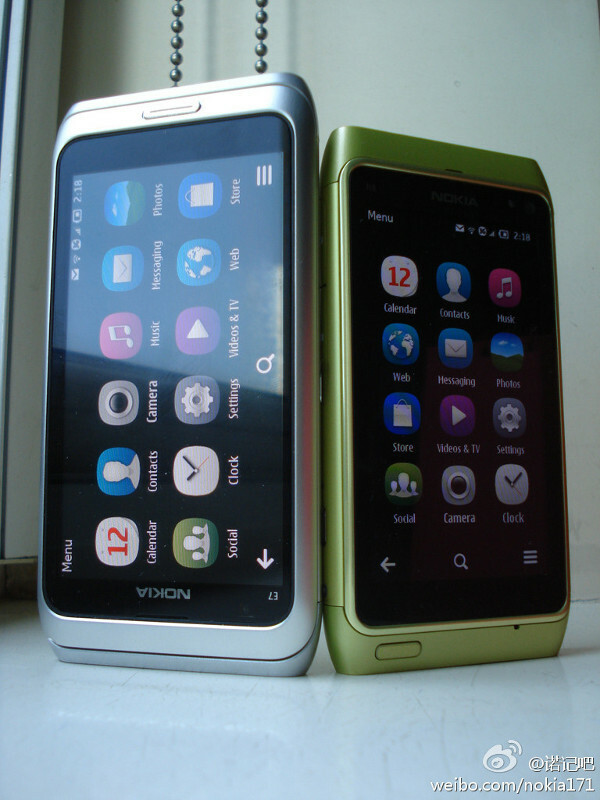 Having said that, my N8 is chugging along just ‘fine’ without Anna, though it would be better with it. It could be a nice new experience again with Belle, though I think by the time that’s available I may have moved onto a new fresh princely Belle device.